But finding the house is only the first step in the process. The next step, finding a Mortgage to pay for your home, is probably just as important. The decisions you make on your mortgage will have financial ramifications for years to come. Having a 30 year mortgage at a quarter percent less will result in thousands of dollars of savings. Adjustable Rate Mortgage - an adjustable rate mortgage, known as an ARM, is a mortgage that has a fixed rate of interest for only a set period of time, typically one, three or five years. During the initial period the interest rate is lower, and after that period it will adjust based on an index. The rate thereafter will adjust at set intervals. Annual Percentage Rate - is the rate of interest that will be paid back to the mortgage lender. The rate can either be a fixed rate or adjustable rate. Amortization - the amortization of the loan is a schedule on how the loan is intended to be repaid. For example, a typical amortization schedule for a 15 year loan will include the amount borrowed, interest rate paid and term. The result will be a month breakdown of how much interest you pay and how much is paid on the amount borrowed. Appraisal - is conducted by a professional appraiser who will look at a property and give an estimated value based on physical inspection and comparable houses that have been sold in recent times. Bi-Weekly Mortgage - this type of mortgage has an impact on when a loan is paid and how frequently. In a typical mortgage, you make one monthly payment or twelve payments over the course of a year. With a Bi-Weekly payment you are paying half of your normal payment every two weeks. This is the equivalent of thirteen regular payments, which in turn will reduce the amount of interest you pay and pay off the loan earlier. Closing Costs- these are the costs that the buyer must pay during the mortgage process. There are many closing costs involved ranging from attorney fees, recording fees and other costs associated with the mortgage closing. Construction Mortgage - when a person is having a home-built, they will typically have a construction mortgage. With a construction mortgage, the lender will advance money based on the construction schedule of the builder. When the home is finished, the mortgage will convert into a permanent mortgage. Debt-to-income Ratio - lenders look at a number of ratios and financial data to determine if the borrowers are able to repay the loan. One such ratio is the debt-to-income ratio. 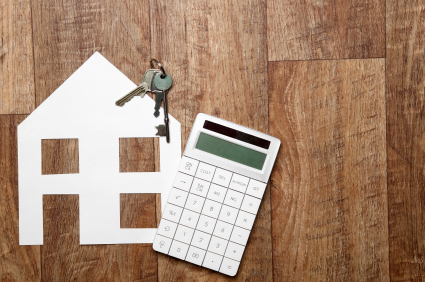 In this calculation, the lender compares the monthly payments, including the new mortgage, and compares it to monthly income. The income figure is divided into the expense figure, and the result is displayed as a percentage. The higher the percentage, the more riskier loan it is for the lender. Down Payment- is the amount of the purchase price that the buyer is paying. Generally, lenders require a specific down payment in order to qualify for the mortgage. Equity - the difference between the value of the home and the mortgage loan is called equity. Over time, as the value of the home increases and the amount of the loan decreases, the equity of the home generally increases. Escrow - at the closing of the mortgage, the borrowers are generally required to set aside a percentage of the yearly taxes to be held by the lender. On a monthly basis, the lender will also collect additional money to be used to pay the taxes on the home. This escrow account is maintained by the lender who is responsible for sending the tax bills on a regular basis. Fixed Rate Mortgage - is a mortgage where the interest rate and the term of the loan is negotiated and set for the life of the loan. The terms of fixed rate mortgages can range from 10 years to up to 40 years. Good Faith Estimate - an estimate by the lender of the closing costs that are from the mortgage. It is not an exact amount, however, it is a way for lenders to inform buyers of what is needed from them at the time of closing of the loan. Homeowner's Insurance - prior to the mortgage closing date, the homeowners must secure property insurance on the new home. The policy must list the lender as loss payee in the event of a fire or other event. This must be in place prior to the loan going into effect. Loan-to-value Ratio - this is another typical financial calculation that is done is called the Loan-to-Value (LTV) ratio. This calculation is done by dividing the amount of the mortgage by the value of the home. Lenders will generally require the LTV ratio to be at least 80% in order to qualify for a mortgage. Mortgage - is the loan and supporting documentation for the purchase of a home. Mortgage lenders generally follow strict underwriting guidelines to limit the possibility of borrowers defaulting on their payments. Origination Fee - when applying for a mortgage loan, borrowers are often required to pay an origination fee to the lender. This fee may include an application fee, appraisal fee, fees for all the follow-up work and other costs associated with the loan. Points - are percentage points of the loan amount. Often in order to get a lower interest rate, lenders will allow borrowers to "buy down" the rate by paying points. Paying a percentage point up front in order to get a lower rate will eventually be a saving to borrowers in the long run if they stay in the house for the duration of the loan. If they move shortly after buying the property then they will likely lose money buying points. Principal - is the term used to describe the amount of money that is borrowed for the mortgage. The principal amount that is owed will go down when borrowers make regular monthly or bi-weekly payments. Private Mortgage Insurance - When the loan to value (LTV) is higher than 80% lenders will generally not be able to do the transaction. In these cases, the borrowers can get private mortgage insurance (PMI) which is a guarantee to the lender that until the borrower reaches a 80% LTV, they are covered from default. To get this protection, borrowers pay a monthly PMI premium. One popular option to get around paying PMI is to take a second mortgage and use it as a down payment on the first. Settlement Costs - prior to closing, the attorneys involved in the mortgage closing will meet to determine the final costs that are associated with the loan. These settlement costs are given to all parties so that they will be prepared to pay the closing costs that have been agreed upon. Title Insurance - the lender is using the home as collateral for the mortgage transaction. Because of this, they need to be certain that the title of the property is clear of any liens which could jeopardize the Mortgage. So, lenders will require borrowers to get title insurance on the property, which will ensure that the homes are free and clear. Truth in Lending - is a federal mandate that all lenders must follow. There are several important parts to the Truth In Lending regulations including proper disclosure of rates, how to advertise mortgage loans and many other aspects of the lending process. These regulations were put into place to protect consumers from potential fraud. Mortgage Terminology - glossary of some commonly used terms in Mortgage lending. Glossary of Terms - useful listing of terms from the U.S. Department of Housing and Urban Development. Consumer Information - information from the FTC on a variety of Mortgage topics. Guide to Settlement Costs - helpful information on understanding Mortgage settlement costs. Loans and Mortgages - informative resource from the FDIC discussing a number of mortgage topics. Energy Efficient Mortgages - information on mortgages with an eye toward energy efficiency. Mortgage Basics - brief overview of how mortgages function and tips for borrowers. Mortgage Amortization - informative site providing information on how amortization works.